Calculations at a regular pentagram. A pentagram is constructed from the diagonals of a pentagon. The pentagram is the most simple regular star polygon. 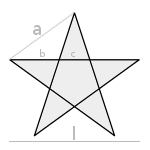 The chord slices of a regular pentagram are in the golden ratio φ. Enter one value and choose the number of decimal places. Then click Calculate.